Atmospheric models constitute the best tools available for the setting of policy, and may, in some cases, be the only tools that are available. The best examples of their kind bring together all current knowledge of pollutant behavior in the atmosphere, making it possible to unravel the often complex interactions between pollutants and atmospheric dynamics. They also allow the possibility of evaluating hypothetical changes in emissions and other conditions to evaluate potential abatement strategies, or to assess the impact of proposed new emission sources. An overview of the air quality modeling application to the development of air quality policy is given here. Short-term air quality prediction for high value episode or winter, summer episodes or under specific meteorology conditions is the basic application for air quality models. A special case of the short-term models is in their application in emergency situations, where they are applied in the case of a pollutant leak or discharge of any type. The objective in this case will normally be to define areas in which concentrations are at dangerous levels, necessitating evacuation or other emergency measures. The major difficulty in emergency response modeling usually lies in adequately defining the source emission characteristics. The effective release point may be at ground level, if there is a steady leak from a tank, or if the release material is denser than air. In the case of a fire, on the other hand, buoyancy may lift the pollutants a considerable distance vertically before transport and dispersion begin. It is also usually difficult to determine the rate of pollutant release, and in the case of a fire, even to know what pollutant is involved. Traditionally, simple approaches such as the box model or the Gaussian plume have been used to assess urban air quality. These modelling approaches can provide quick solutions but rely on significant simplifying assumptions and do not fully describe the processes and interactions that control the transport and behaviour of pollutants in the atmosphere. This is particularly important for pollutants such as ozone (O3) which arises from complex atmospheric chemical reactions as well as being subject to scale dependent transport and dispersion processes. The use of Eulerian grid models, which provide a more realistic and comprehensive description of the urban atmosphere, has been increasing over the past few years. In 2003, R.S. 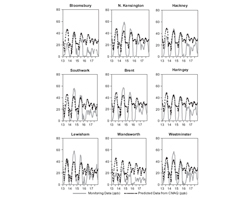 Sokhi reports on the use of the MM5–CMAQ modelling system to predict hourly ozone levels over London, UK. It represents the first application of MM5–CMAQ in the UK for predicting air pollution levels in London. The system has been run on a PC with specifications of 2.0 GHz, 250 Mb RAM memory and 80 Gb HD. Three nesting levels with 9 km, 3 km and 1 km spatial resolution have been applied in this study over the London domain. 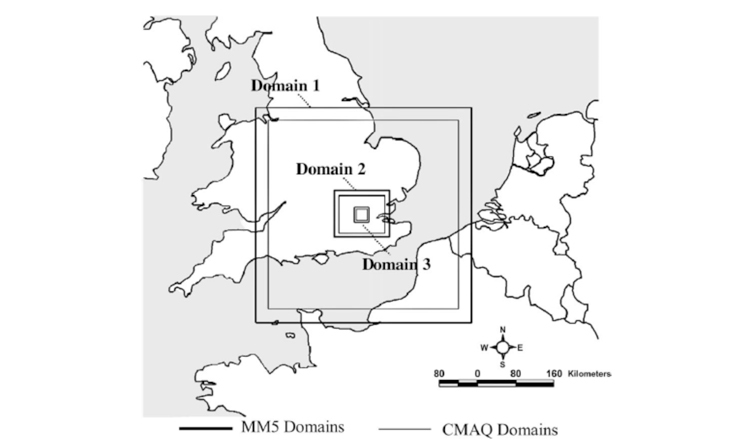 The innermost CMAQ domain with 1 km spatial resolution covers the London Metropolitan area and has been set with a dimension of 24*24 grid cells for this study. The initial meteorological conditions have been obtained from the AVN global model (NCEP/NOAA, USA) for the appropriate time periods. The system requires topography which is obtained from the Digital Elevation Model from USGS with 30s spatial resolution and landuse data which is also obtained from USGS 1 km NOAA/AVHRR satellite data sets. The chemistry reactions were simulated by the updated version of the CBM-IV mechanism (36 species, 94 reactions including 11 photolytic reactions) with the isoprene chemistry mechanism and the Arrhenius type rate constant expressions. 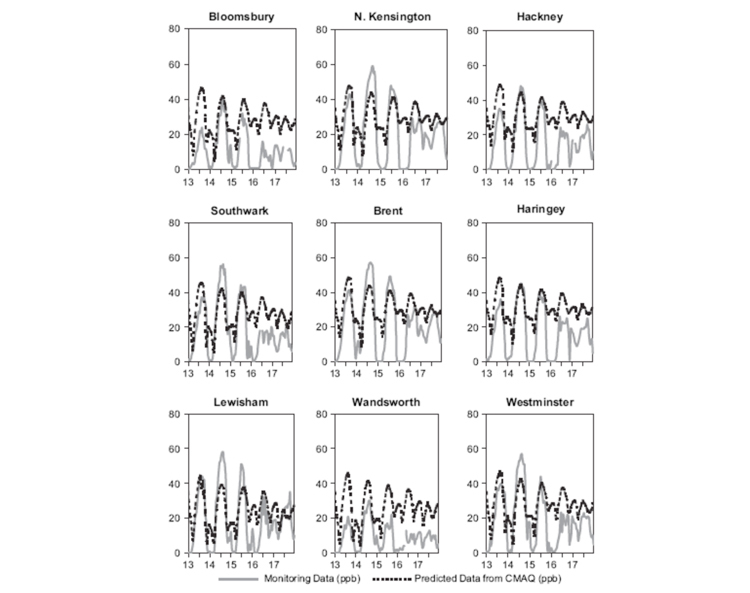 Summer periods in July and August 2002 have been simulated and the predicted results have been compared to several urban background stations across London. Input data for emissions have been derived from the UK National Emissions inventory and from the outputs of the EMIMO emission model. The model performance has been evaluated with measured data through a range of statistical measures. Meteorology conditions during the comparison periods are analyzed firstly. The assessment of the modeling results are developed form the comparison of hourly ozone concentrations, including the measurement trends, comparison of hourly measured and modelled results, and scatter plots, statistical evaluation. Overall, the results display an acceptable agreement between observed and modelled data. 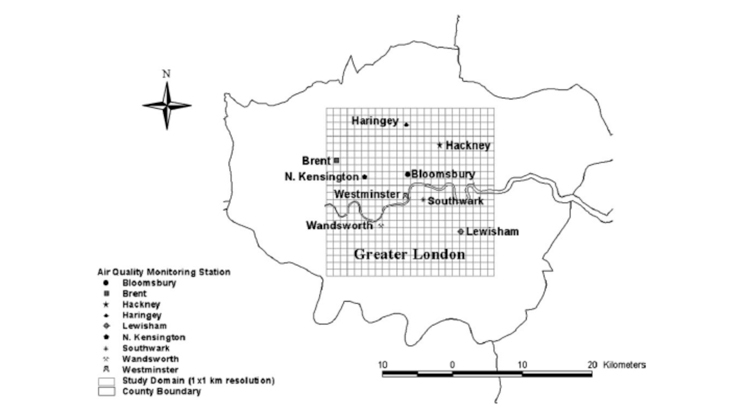 As a number of third generation photochemical models have been developed within the past few years, the performance of the MM5–CMAQ system could also be compared with these models for cities such as London. The model reproduces the temporal trends well but it does less well in reproducing the magnitudes of the measured hourly O3 peaks. The sensitivity of the predictions to the emission inventory and chemical mechanism scheme, especially for nighttimes, will be assessed. A range of other issues also need to be investigated including the sensitivity of the predicted concentrations to initial and boundary values, boundary layer evolution (especially nocturnal) and the relative contributions of advected and locally produced O3. Comparing to short-term air quality models, there are much more uncertainties for long-term air quality prediction. However policy makers almost always want to predict the future: whether it will remain roughly the same or whether some unexpected changes may occur and, if so, at what rate. For climate change and its impact on our environment, probability forecasts of potential future extremes in the coming decades will help us to plan ahead and to make sensible decisions. Chu SH have derived a new t* distribution. It shows that a statistical model based on the t* distribution of station temporal data is capable of predicting the probability of any future outcome to exceed a specific value using only the currently available sample statistics assuming a normal random variable. In an air quality management application the model has demonstrated categorically an average success rate of over 80% both in simulating the current ozone non-attainment areas and in forecasting the rate of future violation of the 8-hour ozone National Ambient Air Quality Standards in the United States for up to 12 years. While the predictability of deterministic climate models is still limited by large uncertainties, the probabilistic forecast by this model provides a promising alternative in assessing the climate impact on environment for decades.